I’ve done it again. I’ve gone ahead and fallen way behind on my posting. Really way behind. I can honestly say this quest is starting to take it’s toll on me. In truth, I never really intended to keep the quest going this long. My original goal was to do one year. But when I hit that, I decided to keep going. Now I can’t seem to stop. I’m still celebrating every day. Still right on track there. It’s the posting part that is wearing me down. I attribute that partially to the change in daylight. I used to be able to wake up with the sun and write in the morning, but now the sun gets up later and so do I. I blame the Yankees as I stayed up way past my bedtime all last week trying to watch their playoff run. I guess that’s over now. I also blame just being tired form the whole thing. I need an exit plan. That’s coming, I just need to right the ship. I ask you, dear reader, to bear with me as I try to catch up again. I throw myself at your mercy. Expect a few posts over the next few days that sum up the past few weeks. I’ll get back on track here. I promise. Just need to catch up first. It was a Friday and I knew I wouldn’t have time to make my own pulled pork. Pulled pork is fairly simple to make, but it does take time and planning to make a good one. I had not planned for this day which meant that I had not left myself enough time to make it. A catch-22, if you will. I wish I had. I like the smell of a pork shoulder that’s been cooking all day in the slow cooker. The aroma alone will make you drool. I also like having pulled pork around for a few days as leftovers because it’s one of those foods that seem to get better on the days after you cook it. But not today. Tonight, I would have to find another source for pulled pork. Naturally I was thinking barbecue restaurant and I started to do some online research to see if I could find a good place. But when it came time to eat, I decided to just go to Clements. There, I picked up a package of Jack Daniel’s Pulled Pork with Jack Daniel’s Barbeque Sauce. It was something that was all cooked and ready to go, I just had to heat it up. I also picked up some bulky rolls, some coleslaw and some ready-made scalloped potatoes (because why not). When it came time to make it, I toasted the bun on the flattop so it got nice and crispy. Then I tossed on the pulled pork along with a scoop of Clements’ coleslaw. For what it is, the Jack Daniel’s pulled pork is pretty good. The meat is nice and tender and the sauce is sweet and flavorful. The sauce is also well distributed throughout so every piece gets plenty of barbecue sauce. You need that in a good pulled pork sandwich. The coleslaw was a nice addition adding in the hint of coolness along with a bit of tartness to offset the sweetness of the sauce. Lola wanted no part of the slaw, but she is never a slaw fan. All and all, not a bad little meal. Sure, had I made my own it would have been better and I would have had more leftovers, but in a pinch, this was a thumbs up especially when it was ready to serve within 15 minutes. A sandwich worthy of accolades and definitely worth a day of celebration. Nothing fancy about this day, but a day that I love to celebrate nonetheless. Eggs are always my fallback meal. If I’m hungry and don’t know what to eat, I can always make myself a fried egg sandwich and be happy. In fact, when Lola is away and I have the house to myself, that’s often what I will make for myself (in my underwear, of course). There was nothing particularly special about today’s egg sandwich. It was a fried egg served on a bulky roll with a slice of cheese and some pre-cooked bacon, but it was a good sandwich nonetheless. I made it so it was a little bit yolk-y, which is a good thing (unless you are driving). That allows you to sop up all the yolk while you are eating the sandwich adding more egg flavor to every bite. Cheers to eggs for providing us so many options for dinner and for baking. I should note that I posted this picture of my sandwich on Instagram and was hit by a comment from a random vegan telling me how cruel it is to eat eggs. I never thought my egg posts would offend anyone. It may be cruel and it may make me a bad person, but my love for eggs will not be stopped. Not today. Not on a day that the world is celebrating the incredible, edible egg. A pretty wide-open category here and a day that is not particularly too hard to celebrate it (and let’s face it, I’m no stranger to celebrating dessert). The hard part was trying to find the right celebration. I went through the mental checklist of all the usuals – the cakes, the cookies, the ice creams, the pies – and nothing was jumping out at me as being right. Then I decided to look in our pantry. That’s when I found my answer. At some point last year, in my hours of mindless googling, I came across something that immediately intrigued me. It was a cake mix. But it wasn’t just any kind of cake mix; it was a Krispy Kreme cake mix. Let that thought sink in: Krispy. Kreme. Cake. I tracked it down and ended up ordering a box of it. The packaging is mostly white in that Krispy Kreme branding style with the logo right on top. The picture of the cake on the package looks especially delicious and the star of the photo is of course the glaze which makes you want it to be exactly like the glaze you find on a Krispy Kreme donut. I decided to save the mix for a special occasion so it has been in the cupboard for about a year now. I decided National Dessert Day would be the day to bust it open. It’s an easy cake to make, just like any boxed cake mix. You make it in a loaf pan so it is shaped more like a banana bread. You add the glaze after it is out of the oven for about ten minutes. The glaze comes in a packet and you squeeze it out all over the top and it spreads out across the cake. It looked fabulous but I must say it was a bit of a disappointment. I was expecting it to taste just like a Krispy Kreme donut and it did not. It was a cake. It had a slight hint of lemon in it which made it decidedly un-donut like. The glaze was good – how can a glaze not be good? – but it too was not exactly like the glaze you find on a nice hot fresh-from-the-oil donut. I wouldn’t go out of my way to make it again but it was definitely worth investigating. I had to take one for the team here and just find out what this was all about. That’s the kind of sacrifice you make on a holiday like National Dessert Day. Lola and I decided to celebrate this very special day with a day of culture because we are so highbrow. While the bourgeois were all at home watching football and munching on cheese doodles, we were in Providence taking in a book reading at Books on the Square. Actually, we were there for a reading from one of Lola’s friends and teachers who happened to be in town to read from her memoir (“The Best of Us: A Memoir” by Joyce Maynard) and we wanted to show our support. Book readings are always kind of neat because you get to hear the story in the author’s own voice (literally) plus you get some background info on the book and the craft. This one was particularly interesting because the author, Joyce, was being interviewed by another author of note, Rhode Island’s own Ann Hood. All in all, not a bad way to spend an afternoon. But all that culture was getting us hungry, so since we were in Providence, we decided to go get dinner at Waterman Grille which was a few minutes away from Wayland Square and also one of the restaurants my company owns so we get a discount there. They are right on the Seekonk River (which admittedly doesn’t sound as charming as it is). The last time we were here was for the wedding of our friends Allie and Eric, but this would be our first time there for dinner. Naturally, we started things off with a bottle of wine for National Red Wine Day. I picked it from the list selecting a bottle of Brancaia TRE which is an Italian blend of Sangiovese, Merlot and Cabernet Sauvignon. I’ve only recently started to understand wines and blends and what the different grapes are – that Vineyard education is paying off. Really, I don’t know all that much, but I know enough to make an educated decision. This bottle also happened to be in the lower-priced range which was also a factor in my selection. The server brought it over, uncorked it and poured me a taste to make sure it was suitable for our needs. It was, so then she filled our glasses. Every once and a while, you need to go out for dinner with the one you love. You just need the experience. The good food. The good wine. The good conversation. You have to get out of the confines of your home for a change of pace. That’s what tonight became. We had a great dinner starting with fresh oysters and fresh bread. I had their burger while Lola went with the braised short ribs. Both were excellent, although Lola’s was better. They went well with our wine too. We worked our way through the bottle and enjoyed the good things of life. A date night on a warm October Sunday evening. That’s how you celebrate Red Wine Day. All you peasants can keep drinking your canned beer and watch your football – we’re going out and getting cultured. Lots of pasta-bilities here and it all starts with a bad pun. Actually, for today’s celebration I was inspired by a pasta dish that I had made last week for National Moldy Cheese Day (a creamy pasta made with blue cheese and tomatoes). It was good. Really good, so I decided to try and make another version with a less pungent cream sauce. On my way home, I picked up some supplies. I went with a pasta called bombardoni which is a wide tubular pasta (really wide) with the ends cut on the diagonal. Think of them as super-sized penne. I’ve never used this particular pasta before but it reminded me of the pasta they use for the Buffalo Shrimp Pasta at Brick Alley Pub which is always a hit. That would be my inspiration although without the heat. I started boiling the pasta and with one minute left to go before it was perfectly al dente, I added in a container of baby spinach. That wilted and cooked right away, so I drained all into a colander and kept it there while I made my cream sauce. That was simple. I made a roux with butter and flour and then whisked in some cream. When that heated up, I loaded in the parmesan cheese which helped thicken up the sauce. I seasoned with some pepper too and pretty soon I had a nice little alfredo sauce going. Then I decided to add some jarred Clements vodka sauce to the mix just to bring in a little more depth. When that heated, I tossed in the pasta and spinach and mixed it all together. Then I tossed in some leftover steak that I had sliced into small pieces just to add some protein. It came out looking good and I served it up with a garlic bread that I had cooked in the toaster oven. I think I can say that I do cream sauces fairly well. In fact, ever since I learned how to make a roux, which was back in the 90’s when I was working part-time at a local pub, the knowledge has served me well. It is the key to my creamy chicken and rice soup (a Lola fave). It helps me make creamed onions for Thanksgiving (a usual request from my brother). And it makes me able to make creamy pasta without hesitation. It has been that knowledge that I have been able to use over and over for good purposes and today was another fine example. This was really good, as you can probably tell. Creamy, cheesy and filling. The pasta was the right choice too – thick enough to have the sauce really bind to it. I may return to this exact recipe again in the future because when you get something right, you tend to want it again. That was my Pasta Day and another testament to the diversity of pasta. There are few foods that can carry so many flavors and tastes and appear in so many dishes in so many forms. That kind of food will always deserve our celebration and our appreciation. And our garlic bread too. Much more to catch up on! More coming soon! If you are ever ordering sausage pizza for Lola, hold the onions. I learned this lesson last year on National Sausage Pizza Day although I learned it too late. That’s when I came home with a pizza from North End Pizzeria topped with plenty of sausage and a plethora of onions. In my defense, when I have had sausage pizza before it was usually at her sister Cherie’s house who enjoys the taste of onions and sausage (maybe even peppers too). But Lola’s not Cherie and I discovered that she is not a fan of onions on pizza the hard way. I think she may have been hungry that night too and craving the pizza that I was boasting about bringing home. When she saw the onions, we slipped into a bit of a dispute that night. A hangry disagreement that mushroomed. Needless to say, it wasn’t my most favorite National Sausage Pizza Day ever. I vowed that this year would be different. I would learn from my mistakes. Today, I would order the pizza without the onions. There would be peace at our dinner table tonight. I got home early enough so that we could explore pizza options outside of our usual. Sometimes you just crave something different and I had time to explore tonight. I asked Lola where she wanted to order pizza. She suggested Pomodoro’s in Bristol – the spot we went to on my birthday who, rumor has it, serve a great pizza and coincidentally, I had been thinking about them too. I called and unfortunately got no answer. That was odd and I really hoped they were not closed on a permanent basis. Most likely it was just a phone mix up or they were too busy to answer (or possibly closed for vacation). Pomodoro’s would have been our preference tonight but we had to come up with another plan. We decided to order from West Main Pizza which is on the other side of town (although only a team minute drive). They have a good reputation and a lot of Lola’s friends swear by it. I’ve had it before and it was good, so I had been craving it as someplace different for pizza and it seemed like a good idea so we could mix up our pizza usuals. I called in the order and then went to go pick it up when it was ready. Sausage pizza, no onions. I am happy to say no fighting ensued tonight. We just sat back and enjoyed our pizza like a loving couple. The pizza was loaded with crumbles of sausage which were tasty. Plus it had tons of cheese which is always a pleasure. When you get pizza from a place outside of your norm, you tend to give a tough evaluation of the quality – trying to decide if it deserves to be in your top choices of places to go. West Main was good, but we decided we’d stick with our regulars. The crust at West Main is whole wheat which, although I like the doughiness of it, the taste is not my favorite. I guess I crave the usual crust. Lola also felt the sauce was just ok – a little too ketchup-y. Sauce critique is usually Lola’s thing – she knows a good pizza sauce. When we had been there before, the pizza I ordered was one of their specialty pizzas which was really good and topped with really tasty toppings. Tonight, we just ordered pizza with sausage, so not their specialty. I’ll always recommend West Main to anyone asking especially because so many of our friends like it, I just don’t think we’ll go out of the way to get it again. Don’t tell Lola but I was hoping that the pizza tonight would have been the kind with sliced pieces of sausage scattered around with plenty of onions too. I just think the two make a nice combination. I of course understand why someone who doesn’t enjoy onions wouldn’t like that and why I should have known this about my wife. But still, that is my vision of a good sausage pizza. That’s the kind of pizza that deserves it’s very own day of celebration. This year’s National Sausage Pizza Day was better than last year’s, but I still have a ways to go before this day becomes my favorite day of the year. That’s going to take finding a new pizza place and negotiating and acceptable onion compromise. I’ll keep trying. It’s a tough job, but someone has to do it. Last year on National Angel Food Cake Day I made my own cake. I remember it being an odd cake to make. I recalled it using a lot of eggs and checking back, I was right. It used a dozen egg whites in the recipe. That was the day I figured out the difference between a Sponge Cake and an Angel Food Cake (Sponge Cake uses yolks while Angel just goes egg white) and making one is not unlike making a meringue except you add in flour and sugar. I remembered it wasn’t that hard to make and it was kind of good, although I made a note about too much almond extract and that triggered a sense memory of that particular taste. I ended up serving it with ice cream and topping it with chocolate and caramel. My recollection was that it was a good dessert but not crave-worthy. That was my dilemma tonight: should I make a cake that I wasn’t all that excited about eating? It sounded like a bad use of my time. I decided that the best solution would be to buy one. My plan was to stop at the grocery store after work but when that time came, I made a stop at Lowe’s first and when I was finished in there, I plum forgot to go to the market. We were going to have leftovers for dinner and that’s why stopping at the grocery store wasn’t a priority in my mind. I didn’t realize this until later that night when I was home and about to get into something else. I stopped in my tracks and let out an, “Oh No!” Lola asked me what was up and I said I needed to get an Angel Food Cake. She jumped to my rescue though and said she would hop out to Clements and pick one up. She was the angel of the Angel Food Cake today (which I think is a Juice Newton song). I told her to look for one that was already made in the bakery or freezer sections and if that wasn’t an option, look for a boxed mix. When she got home, she had a fully baked and ready to eat Angel Food Cake from the bakery. She had saved the day. We ate our leftover dinner and then later, it was time for dessert. Now I just had to think about how to prepare it. During the day I was looking up recipes for Angel Food Cake hoping to find other ways to use the cake so that I wasn’t just be eating a piece of spongy cake. I kept seeing calls for churros made with Angel Food Cake. Now that was something I could get behind. That was that game plan. I took the cake out of the container and cut off a few pieces and I cut those into rectangular pieces. Then I heated up some coconut oil in a frying pan and when it was hot enough, I fried the cake in the oil. That crisped up the outside nicely although I did have to keep a watchful eye as a few pieces seemed to get a little crispier than intended. When the freshly fried pieces came out of the pan, I tossed them in a bowl with some cinnamon and sugar and thoroughly coated each piece. Then I put the pieces on a plate and I served it with some heated chocolate sauce. First off, they looked great. It’s hard not to look at anything coated in sugar and cinnamon and not be pleased. They didn’t taste exactly like churros but they were still good. They had a good crispy texture on the outside and they were nice and warm too, especially when dunked in the chocolate sauce. You could taste the Angel Food and that meant the taste of the almond extract was strong. That’s not my favorite taste. Lola’s main contention was the texture of the sugar and cinnamon which was a little coarse and reminded her of sand – probably Lola’s least favorite texture. After some deliberation, we decided they needed a creamy element to the plate like fresh whipped cream or even better, vanilla ice cream. In truth, they were just ok. A good idea but it just didn’t come through in the end. I would have rather had plain Angel Food Cake or regular deep fried churros. I guess I am more a traditional cake lover. I like the density of a nice piece of cake that can support good heavy frosting. The lighter, fluffier sponge cakes or Angel Food Cakes just aren’t my thing. I will say that they are good for soaking up the flavors of whatever you serve it with. That’s one of the things that went wrong tonight – the cake soaked up the flavor of the coconut oil and that flavor came out in the end. Angel Food Cake has a good texture in and of itself. It’s almost bouncy on the tongue which is a nice change of pace. Still not my favorite, but on National Angel Food Cake Day, I did my best to celebrate. Growing up, moldy cheese to me was the cheese that we’d find in the cold cuts drawer of our fridge that decided to hang around a little longer than it should of. My mom would look at it, smell it, see if she could somehow salvage it, and if it was completely unrecoverable, throw it away. My mom had some kind of evil plan to make us eat moldy food. She always said it was because she was a child of the Great Depression which taught her to make everything last as long as possible. That meant if a loaf of bread went moldy, she’d dig into the bag of bread and find a few pieces that weren’t too bad to make our sandwiches. I can barely speak of the liberties she would take on the state of freshness of the turkey that she’d use for our sandwiches. I guess if it didn’t smell too bad, that would be ok for our lunch (which would sit in our locker unrefrigerated for a few hours before eating). I’m still sketchy to this day about deli turkey and will rarely use it if it’s been in our home for more than a few days. Then, if the cheese was moldy, my mom could just cut around that or she would mix it into a mac and cheese where it would melt and we’d be none the wiser. That’s moldy cheese to me. You can understand why I was a little taken aback at a whole day devoted to celebrating this holiday. Thankfully, moldy cheese is not cheese that has gone bad. The moldy cheese we were celebrating today were those cheeses that actually want mold inside them to give them more flavor. It is made by piercing a ripening block of cheese with skewers in an atmosphere in which mold (specifically penicillium roqueforti and the penicillium glaucoma fungi) is prevalent. The mold grows within the cheese as it ages and it creates distinct blue veins in the cheese, which gives them their name and, often, assertive flavors (like your Roqueforts, Gorgonzolas and Stiltons). Sounds gross, but to the cheese lover, this was a great development. Last year on this day I made a favorite that we will bring to parties sometimes – dates stuffed with blue cheese, wrapped in prosciutto and sprinkled in honey. Always a hit. This year, after searching online to see what I could make with a moldy cheese, I found my answer in a pasta dish. I liked the recipe I found but I also felt it needed a little something else, so I ended up creating my own dish. And you know what? I may be on to something here. The recipe I found was from a place called Framed Cooks and it was for Pasta with Blue Cheese Spinach Sauce. It was a very simple recipe and I liked that it was made with spinach to help cut the strong flavor of the blue cheese. But then I wanted it to have more. I thought about tomatoes and how well the taste of tomatoes goes with blue cheese. I figured adding that in would be simpatico. I started by putting the pot of water on for the pasta. The recipe called for a short pasta and for some reason, bow tie pasta was what I decided on (and it was the right choice too). When the water came to a boil, I dropped the pasta in which would cook for 12 minutes. After 11 minutes, I added a whole tub of baby spinach right to the pot and it cooked along with the pasta. Then I drained it all and returned it to the big pot. While the pasta was cooking I diced up some onions and garlic and sautéed them in some oil. Then I plopped in a whole container of grape tomatoes and let that cook. I just learned this term, but this is called blistered tomatoes because you essentially cook them in a pan until they soften and actually burst open. This cooked the whole time the pasta was cooking so after I returned the drained pasta and spinach to the pot, I added in the tomatoes , onions and garlic. Then I dropped in about a half stick of butter (maybe a little more) and two 5 ounce containers of crumbled blue cheese. I added salt and lots of pepper. Then I stirred it all together. It took a minute or two before the cheese started to melt, but then it did and all of a sudden, I had something good on my hands. We were watching the Yankee game and Lola was lost in her work while I delivered her a beautiful bowl of the pasta. She said it looked good and she was excited for it. Then we both tasted it. Wow. This was awesome. The flavor of the blue cheese came out strong, but not overpowering. It was cut by the butter and juice from the tomatoes. The pasta was cooked perfectly so it was soft enough to soak up the sauce which gave each bow tie extra flavor. The tanginess of the spinach was perfect too adding a little earthiness to the pungent blue cheese, and then also softened by the sweetness of the tomatoes. A blistered tomato lets you bite it without fear of it bursting all over your self. You still get the juiciness of each tomato and in this dish, that juice mixed well with all the blue cheese. Pardon my boasting, but it was a beautiful balance of flavors and a great creation. A surprise hit. We thought that some sandwich steak chopped fine (or any steak diced up for that matter) would go well in here too. This was really a dinner that surprised us on how delicious it turned out to be and one I will be making again for sure. I guess we really can celebrate moldy cheese with a smile on our face. I’m just glad my celebration was not a warm turkey sandwich on moldy bread and some spotted-green cheese packed with a note that said “pick around”. No, moldy cheese is much more of a complex and enjoyable flavor. Blue cheese is usually reduced to salad dressing or something to dunk our hot wings in, however on National Moldy Cheese Day, we realize that it is more than that. It is a complex cheese that was made with care specifically to bring out that pungent but delicious flavor. That’s what we celebrated today – the flavor that moldy cheese delivers. I’m here to say moldy cheese deserves our celebration. It needs to be saluted when it shows up on our cheese boards. It needs to be respected when it is melted into a cheese dip. And it definitely needs more love for being something that is wonderful in pasta. Yes, I learned to love the moldy cheese today. I guess my Mom was ahead of her time on knowing to appreciate that. To celebrate a Fluffernutter, you have to start with Fluff. There are other spreadable marshmallow cremes on the market, but for anyone in the know (especially New Englanders in the know) the only acceptable brand of marshmallow creme is Fluff. Fluff is made in Lynn, MA although it was originally made in Somerville, MA. It was created in 1917 by entrepreneur Archibald Query who came up with the recipe and then went door-to-door selling his sweet creation which makes me wonder why there are no more door-to-door marshmallow salesmen anymore. There were other marshmallow cremes before Query’s, even one by the great, great, great grandchild of Paul Revere, but Fluff was the one that really took off and part of that success was because Query sold his Fluff recipe and rights to candy makers H. Allen Durkee and Fred Mower in 1920 for about $500. 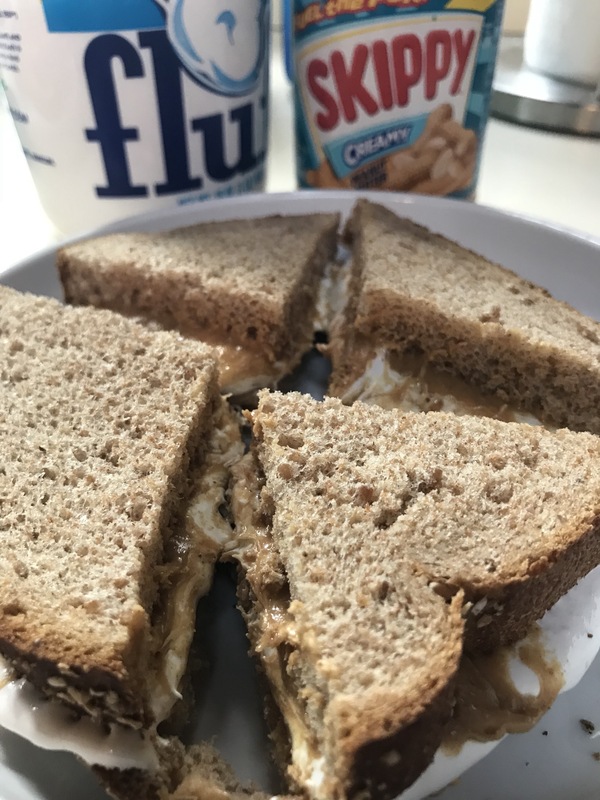 As far as combining Fluff with peanut butter to create a sandwich, that came earlier in the century from some of the other marshmallow cremes on the market and took off in popularity during World War I when Americans were asked to give up meat one day a week to help with the war effort. The name Fluffernutter wouldn’t come around until the 1960’s when Durkee & Mower hired a PR firm to help sales. That’s when some marketing genius invented the name that would eventually become world famous and even have a holiday named after it. That’s what today would be all about. I decided to have a Fluffernutter for breakfast because I had to go to work at 11. I asked Lola if she wanted one too and after a long moment of consideration, she said yes. I had wheat bread on hand and that would work for our sandwich although I personally prefer white bread. I decided to toast my bread although Lola is a firm anti-toast believer for her Fluffernutters. She gave me a stern look of disdain at my own choice of toasted bread, but I couldn’t help it – I just love how the peanut butter starts to melt on the hot toast. We agreed to disagree. Making a Fluffernutter is easy enough, but it’s a dirty job. Fluff sticks to everything it touches, so you usually have to use two knives so as not to mix the PB into the Fluff and vice versa. Then when you slice it, you get it all over your cutting surface. I used to work at a restaurant that sold a Fluffernutter (available at market price) and it was always the worst sandwich to make because you had to completely clean your station after you made one. For today’s sandwich artistry, I had lots of Fluff on hand because that’s what I use for my fudge and for the peanut butter, we used Skippy. I spread the peanut butter first on both pieces of bread, then topped that with a big scoop of Fluff which I spread out as best I could. I then closed the sandwich up and cut it in half (I cut Lola’s into quarters just to be cute). Massachusetts started legislation to make the Fluffernutter the official sandwich of the Commonwealth. That motion has been stalled in the State House for over ten years which I don’t understand. Who is voting against this sandwich? Who wouldn’t want to take credit for this creation? If it were up to me, I’d be voting YES! I’d be proud to have this sandwich represent my home state. It’s a sandwich of great renown in these parts and well as being one worth our celebration. Official or not, it’s still a sandwich that gets high praise in our house. It delivers simple joy with the best of local ingredients. It gives us comfort. It gives us ease. It gives us warm, happy flavors. That’s the New England way and why we are here to stand proud with Fluff. We’ll promise to clean up after too. I’m way behind and I can’t seem to catch up. I know, I’ve been saying that for a while now, but every time I get close to getting all caught up, I end up taking a day or two off from writing the posts and the hole gets deeper. The celebrating is still happening. I’m right on pace there, it’s just the blogging part. I had to right the ship. With some hesitation, I have decided to pull the nuclear option. I’m just going to slam out one longer post which retells my celebration tale of the last nine days. Not the way I like to do things, but I feel this will be the only way I can get back to some kind of normalcy. Well, at least the kind of normal life where you are celebrating every day. So here we go. I’ve unlocked the football, I’ve put in the codes in, I’ve wished Godspeed to all those within ear shot and I’ve hit the button. I’ve gone nuclear. Every day is Coffee Day, at least in our house. Although today, Lola wasn’t around. She had gone to New Hampshire to visit a friend. I woke up early and, as usual, made myself a cup of coffee using our Aeropress which is a contraption to give you good strong coffee. There’s a whole process to making coffee with an Aeropress that Lola likens to the dance of shooting heroin. You start by putting the filter in the bottom, then your coffee goes in, you pour boiling water over the top, stir, and then slowly work the top half of the contraption downwards into the bottom half like a plunger. That air presses the coffee out the bottom through the filter right into your cup. After I added my frothed milk (I’m a fancy boy), I grabbed the cup and walked outside to our deck to look at the sun which was rising in a particularly brilliant fashion. Later, on my way to work I stopped at Starbucks to get a Grande Non-Fat Latte (I speak Starbucksese). I don’t usually stop here as it is a bit out of the way, but I thought I’d make the special trip for National Coffee Day. I’m not sure if it was worth it. The coffee was fine – I really do like Starbucks coffee – but there were no other redeeming qualities about the visit. It was just business as usual. Later in the day, I made a cup of coffee at work. Nothing fancy here either. We have a Keuring machine and fresh cream in the fridge. It’s perfect for that afternoon pick me up which is what it gave me today. Last year on National Coffee Day I enjoyed nearly ten cups of coffee. This celebration was more sensible. I thoroughly enjoyed each cup for what it was. It helped me get through the day and I looked forward to that first sip from every cup. That was a celebration that was worth having. I had a long day ahead of me at the Vineyard and I was running late. (I could start every Saturday post with that exact statement). On my way out the door, I remembered it was National Chewing Gum Day so I grabbed a package of gum that has been sitting in our cabinet since the start of the summer. It was a pouch of Big League Chew. I can’t remember why I purchased this gum outside of thinking Lola would enjoy it. Apparently she doesn’t share the nostalgic fondness for this type of gum that I do. In any case, I tucked the pouch into my pocket and headed out the door. Later that morning, I remembered that I had the gum in my pocket, so I pulled it out and tore it open. I took a pinch of the strands and placed it into my cheeks. I don’t think there’s a way to do this without feeling like you’re shoving a wad of chew into your mouth. As a kid, that was a neat feeling because you had watched baseball players do this for years (with tobacco) and Big League Chew allowed you to mimic the same action (with less nicotine). I understood why I and every young baseball fanatic liked this gum. The gum is good too – fresh bubble gum flavor, very chewy, the pouch keeps it from drying out and it has excellent bubble blowing capacity. Not much more you can ask for. I asked a few other people if they wanted some. Not everyone did, but most were excited to see this blast of gum from their past. It evoked instant memories. Even the smell. It was a moment of joy. It reminded me of the time in our lives when gum was kind of a big deal. It was more than just something you toss in your mouth to give you fresh breath. It was a treat. It was fun. I shared that today with some people. That’s what celebrating gum is all about, and all it took was a pinch between my gum and cheeks. Last year’s Homemade Cookie Day was kind of a big deal. It was the wedding of my young cousin Sam, so we were in Connecticut with my side of the family. I made cookies for the occasion that my sister-in-law Becky was nice enough to school me in (in fact, she made most of them). They were shortbread cookies that we decorated as musical notes reflecting the musical theme of the wedding. They were a smash hit. This year however, there would be no baking. My celebration would be just an appreciation for the homemade cookie. I did this by enjoying three cookies with milk after dinner. The first cookie was a Tollhouse cookie that I had made a few days ago for my sister’s birthday. She had requested them. I am not a famous Tollhouse Cookie maker by any stretch, but my grandmother was and it’s what my sister was craving. She even gave me one of Gram’s secrets to her cookie making – to use half butter and half shortening for the recipe. That’s what I did. The cookies were ok, but not like my grandmother’s. I’m not exactly sure why. Someday I’ll figure it out. The one I had tonight was fine. I just can’t seem to make a great Tollhouse Cookie. The second cookie was an Oatmeal Cookie which was made with love by the mother of one of Lola’s friends. This was the friend Lola had gone to visit in New Hampshire and one of the side benefits of those visits is that Lola is sent home with a plate of treats from her friend’s mom. We call them Jarvis Treats and they are the best. It’s always an array of goodies like chocolate bark, fudge, some kind of peanut butter thing and always some cookies. Whenever Lola walks into the house with them, we have an instant feast like we just found our Easter Basket. For my cookie from the plate of treats, I went oatmeal. That was actually the only cookie left although there were still other non-cookie treats that we could enjoy later. It was good – soft and chewy with just the right amount of crunch from the oatmeal on the outside. A few raisins mixed in and that’s not a bad place to find a raisin. Anytime you can have a Jarvis Treat is a big deal to us, so I savored this one especially because it was National Homemade Cookies Day and I was paying homage to one of the finest homemade cookie makers we know. October is not only National Chili Month, but the first week of October is National Chili Week. Monday night is also a good night to make a good hardy chili to have some for the whole week, so that’s what I made. I picked up some ground beef and tomatoes at the store. When I got home, I sautéed some onions and garlic. I had some fresh jalapeños in our fridge so I diced those up and sautéed them along with the onions and garlic to bring some heat. Then I added in the beef. I seasoned the hell out of it all and let it cook. Then I added in the tomatoes and beans and let it cook more. Pretty easy. I wanted a little more liquid in the chili, so I decided to pour a full beer in. Couldn’t hurt. All in all, it came out pretty good and I found it to be one of the tastier chilis I have made in a while. I made some Jiffy corn muffins on the side (which seems like a must-have for chili). I served us bowls of chili with cheese and sour cream. We enjoyed it on our couch watching Last Week Tonight with John Oliver. Now we have chili for the week. We had a nice hardy and warming supper. And we celebrated this great food as if it was a holiday, which it was. Not going to lie, this was a hard one. It was National Caramel Custard Day and to celebrate that, I was going to pick up some flan at Whole Foods. I looked online and they said they carried flan there so I drove to the spot in Cranston after work. That’s when I realized that Whole Foods lied to me because they did not carry flan. With tears in my eyes, I left and headed for home. I would have to break the news to Lola. She takes her flan seriously. I couldn’t think of any other place to get flan outside of a Mexican restaurant which seemed too far out of the way to go pick up, so I decided to celebrate the fact that it was also National Soft Taco Day. This was an easy fix because I had soft tortillas, I had chili for a protein and I had all the lettuce, tomatoes, cheese to make a taco. When I got home, after a half-hour verbal berating from Lola on why we were flanless, I started to make dinner. The tacos came out looking pretty good. However, in practicality, this was a fail because the chili was a bit too liquidy for tacos, especially soft tacos. Once they sat for a minute, all the chili soaked through the tortilla and the tacos came crashing apart. I was able to get a few taco bites in, but then I essentially had an open-faced taco which I ate with a fork. I should have known better, especially as someone who considers himself knowledgeable in taco making. The taste was great, I just failed in my construction. Not a banner day of celebration, but still I paid tribute to the greatness of tacos. If only I had more time to celebrate them. We ordered fresh guacamole which they made table side. Lola asked our server how she likes her guacamole and she told us that she puts a special hot pepper in hers that is lightly fried to bring out more flavor. The server was nice enough to get us one so we could try. We mixed that right into the guacamole. It was spicy – not in the front but kept intensifying on your tongue. It was good. I would have liked more cumin and salt in the guac, but that’s just me. Then we ordered tacos to which our server remarked that it was National Taco Day. We told her that we knew this. Lola went with all pork carnitas tacos while I went with an order that had one carnitas, one chicken and one steak. The tacos were good and fresh. Each had beans and rice in the taco along with fresh salsa and sauce. All cooked perfectly too. Great flavor in all and I was a fan. This will be a place we will come back to for our next Mexican food craving. We were stuffed as a wood tick, but then they showed us the dessert menu and there it was – Flan! I knew it was a day late, but I decided to order it and celebrate National Caramel Custard Day too. It was a great flan served with caramel over the top plus some chocolate and strawberry sauce on the side along with ample amounts of whipped cream. The texture of flan is always alarming – it tastes like you’re biting into phlegm. But once you get past that, the sweetness of it all gets better. A good flan. All in all, I think we did a nice job at celebrating National Taco Day. We found a new local, authentic restaurant. We toasted with big margaritas and we capped it off with a delightful flan. That’s a good day on any day, but particularly special for National Taco Day. Betty and I go way back. I recalled this special treat from last year and when hearing about it, not knowing what it was. It’s pretty much an apple crumble. As far as who Betty is, no one really knows. Only the legacy of her special treat carries on. When I got out of work, Lola was over her sister’s house so I decided to head there to say hello. We ended up getting home at about 8 PM which meant I still had to make an Apple Betty. Thankfully, it’s super easy to make. I had picked up five granny smith apples at the store along with some vanilla ice cream. I peeled and pared the apples and tossed them in a pie plate with some orange juice. Then I made the crumble from butter, flour, sugar, nutmeg and cinnamon (Full recipe from Genius Kitchen). I sprinkled that over the top and then tucked it in the oven for about 45 minutes. It made the house smell awesome – baking apples tends to do that. When it came out, I let it sit for a minute or two, but then I scooped out a couple of pieces and topped them with some vanilla ice cream. Honestly, this is everything you could ever want in an apple dessert. The apples get soft while the crumble gives you a more hardy texture. You get the sweetness coming through from the crumble (and from the apples) and it is all paired with the creaminess of the cool ice cream. It’s perfection, and perfect on a nice Fall night, even if that night is seventy degrees. I am always amazed at how much the apples break down. They almost turn to mush, but not quite. When you bite down, it just melts in your mouth. I still don’t know who Betty is or was, but I’ll forever be grateful for her contribution to the dessert table. It really is one of the best tasting desserts you’ll find for the simplest of cooking procedures. Thank you Betty, for your apples and your crumbles. Today you were celebrated with spoon and ice cream, and life was a bit more joyous because of you. I learned today that there is a difference between noodles and pasta. It has to do with the type of flour used in the noodle making. Noodles are actually thousands of years old and come from China. Italians started making noodles after Marco Polo brought them back from his adventures in the East. The Italians started making their noodles with durum or semolina flour and that’s what would become known as pasta. Today however, I would be using spaghetti which is a pasta but made in the tradition of a classic noodle. We were still celebrating National Chili Week as we had been all week with the batch of Chili I made earlier in the week. We find that chili spaghetti is a great way to get another meal out of a batch of chili. It brings a little variation to the party after having had straight bowls of chili all week long. I think chili spaghetti is a Cincinnati thing, or at least that’s where we first saw it featured on a cooking show. It intrigued us, so we made it one time and it got a big thumbs up. There’s nothing fancy about it or no special preparation. You make the spaghetti as normal. When it is drained, I like to add some butter to the hot noodles just to give them some flavor. Then you top each portion with some heated up chili. You dress it like you would your regular chili with cheese and sour cream, but then you are ready to go. It’s essentially a thick meat sauce on your pasta, like a bolognese but more hardy. Tonight’s offering was particularly tasty. We both remarked on this although we couldn’t figure out why. I felt like the pasta was cooked perfectly while Lola hypothesized that the chili was a bit more saucy than normal which helped. Whatever the reason, this was a great dinner. It’s filling but oh so tasty. The noodles absorb the flavors of the chili so each strand brings a little flavor to the party. Plus the chili gets mixed throughout. It was really great and I always recommend serving your chili this way when you are laboring your way through that week of chili. By the third or fourth day, you just want to mix it up, but you also want to use up all your chili. This gives your meal another life and I may even say it’s the best way to eat it. For National Noodle Day, this was a great way to honor the noodle and what it brings to the table. The noodle soaks up all the flavors that you are working with and delivers. That’s why the Chinese created this wonderful food and why the Italians took the recipe and ran with it. Maybe that’s what the Cincinnatians did too when they thought of chili spaghetti. Who knows, but all we know is that we celebrated with glee. There are essentially two kinds of frappes. The first kind is an iced coffee beverage made from instant coffee originally from Greece. This is the drink that you get at Starbucks. The other kind of frappe is a milkshake or more specifically, it’s what a New Englander calls a milkshake. I’m not sure who this New Englander is because all the New Englanders I know call them milkshakes (or cabinets, but that’s a Rhody thing). In any case, I was going to enjoy my Frappe after work and because I didn’t need a boost of caffeine at that time, I decided to celebrate the milkshake type of Frappe. I always tend to lean towards celebrating with ice cream when I can. After work I headed towards Frosty Freez thinking I could get a fine frappe made just to my liking. I soon discovered that Frosty Freez has closed for the season. A sad day here on the island. I was picking up some Chipotle for dinner, so I decided to check one other spot for a Frappe to go: Newport Creamery. They were open, but the ice cream line was too long for my patience. I decided to just make a frappe at home. I picked up our burritos and came home to Lola and we feasted on our dinner in style. Later in the night, it was time for my frappe. Lola asked me if I was making it the way her friend makes it: with Nestle Quik and a little bit of vanilla. I wasn’t going too, but that sounded like a good idea. I grabbed the blender and filled it with milk, vanilla ice cream, generous amounts of Quik, a capful of vanilla, a few squirts of chocolate syrup and then for fun, a scoop of Fluff. I blended away and then poured it into my glass. It was nice and thick and it passed the straw test – that’s when you put the straw in the middle of the drink and it stays there (it doesn’t fall to the side of the glass). This was actually one of the finest milkshakes I have ever made. It was really chocolaty thanks to the syrup and the Quik. There were lots of creamy elements to it with the slight tinge of vanilla as a nice finishing touch. The Fluff didn’t really blend well so that was floating around in chunks and getting stuck in the straw, however, it was nice to have the little bites of marshmallow when you got them. A little more sweetness never hurt anyone (except a diabetic). It had been a long hard day at the Vineyard and this was a nice way to end the day – with a cold, creamy thick frappe. I may be that New Englander that starts calling these things frappe – it just sounds a bit more celebratory. I’d like to apologize for two things to my loyal readers. First, I’m sorry I have fallen so far behind at getting these posts up here. I know you have bigger problems to worry about then why I haven’t posted, but I do feel like I was letting you down. I’m going to get better at it now that I’m back on track. Second, I apologize that this post is so long. I didn’t get into much detail with each day of celebration and I may have overwhelmed you with nearly 4,000 words. This isn’t the norm – it’s the nuclear option and you really can’t use that all that often. So thank you for your patience and understanding. I’ll get better. The celebration continues and I am grateful for all your support. This was a holiday that was going to be pretty easy to celebrate. All I needed to do was drink a beer. I have no problem finding beer these days. I know right where to look for them and when I buy them, I never get any hassle. Apparently, I’ve aged out of that “let me see your ID” stage. I’m also not the kind of person whose need of a beer (as in having already had too many) is often questioned. The hard part was going to be selecting the place to have a beer and of course the type of beer to have. Both of these questions were answered for me. Today we had an after-work team event at a local golf and entertainment complex and there was going to be beer there. This would be the perfect place to celebrate National Drink Beer Day. The place is called Mulligan’s Island which is kind of your typical golf and entertainment place. It has both a Par Three and a Pitch and Putt course but also a driving range, two mini golf courses, batting cages and beach volleyball. It’s in Warwick and somewhat oddly situated alongside the State of Rhode Island Department of Corrections. (No, that’s not a facility where they help you correct your swing.) Our group had use of the driving range, the batting cages and the mini golf (that was our “time in the yard”) plus we had some burgers and a station for beer. It ended up so that only about 15 or so people were able to come, but it was still a fun group and an enjoyable place. I started off in the batting cages where I swung mightily at the slow pitch softballs while the ladies took on the fast pitch softball machine next to me. Yes, I felt a little less manly waiting casually for my lob pitches as the sound of whizzing softballs coming in hard against the backstop filled the air. But slow pitch is more my style. That’s probably the only speed at which I have hit a baseball in the last thirty years and I wasn’t trying to be a hero today. I got some good swings in – probably a bunch of doubles, maybe even a homer or two. But then the pitches kept coming. We were paid in advance, so the machines didn’t stop automatically at ten balls. They just kept coming. Pretty soon, I had broken a sweat and my hands were starting to callous. After the batting cages, we went back over to the party area where the beer was ready for us and I was quick to swoop one up. I went for a can of Corona which seemed ideal. The design of a can of Corona, a somewhat new addition to the beer aisle, is pleasing to me. It resembles the iconic Corona look that we have seen for years on their cases. The white of the can makes that logo really stand out when you see it. In any case, it’s a fine looking can and the perfect choice for a cool Fall night at the driving range. I opened it up and then moseyed on over to the range with a bucket of balls. I’ve never been one to enjoy hitting a bucket of balls. I enjoy hitting a few balls, maybe even half a bucketful. But if you give me a whole bucket to hit, it wears me down, my hands get calloused and I get bored. Part of that comes from my inability to hit a driver. I can crush an iron and even hit it straight some time. But if you give me the big boy clubs, I flub it. Sometimes they barely go ten yards even though I put all my energy into the swing. Every once and a while I can get it right, but usually I just hit a high pop fly right back at the pitcher. Also, when you are at a driving range you get the feeling that everyone is watching you (they aren’t), but this adds to that sensation of failure and embarrassment. I managed to stick with this activity for a good chunk of time and even outlasted most of our group out there, but then I had to quit. My hand was blistered. My arms were sore (my neck was sore too because I was smacking it with the shaft of the club on my back swing – that’s a new one). And I was hungry, so I put down the club and went to go grab a burger. It was National Drink Beer Day so when I finished up my first Corona, I reached in for another. I kind of felt that I was giving this holiday an appropriate celebration. I could have gone crazy today and grabbed a beer ball of Genesee Ale from the packie and finished it off with Lola in our backyard – an exercise in excess. But today, I drank beer in that perfect social way. It helped break the ice in what could have been an awkward social gathering. Just having a beer in your hand makes this kind of event easier – a 12-ounce aluminum crutch. But it also keeps you refreshed too. A little way to take the edge of a long day, and a way to hydrate yourself after working up a sweat swinging sticks at balls. You can’t drink a nice glass of wine after hitting a 40 mile an hour, arching softball clean over the pitching machine – you need to drink a nice cold beer like a man. It just seemed right for the night and a proper tribute to the enjoyment of drinking beer. Right after I cracked open my second one, the call to play mini-golf was sounded so I joined up. There was a group of five of us and we took off to the links. They have two courses there and one was more difficult than the other. The less-difficult course had more people on it, so we opted to play the hard course. And it was challenging. It didn’t really have obstacles likes lighthouses and clowns, but it had long greens with different hills and uneven surfaces, it had thin bridges and rocks to hit around and over, and it had a certain amount of water threatening nearby. I started off playing terribly with my first putts landing my ball in nasty corners. That was followed up by playing the back and forth game and hitting the ball three or four times before it plunked in the hole. As play moved along I got better, but it was too late. I had already fallen too far behind to even try to catch up. I ended up getting a 36 on the front nine with a 26 on the back, but it was not enough. I came in fourth place. I suppose the worst outcome was that they sent an email out the next day with all the pictures from the night and I was featured in one digging the ball out of the water hazard. It wasn’t my ball – I was trying to save someone else’s – but I’m sure everyone just assumed I was having a tough day on the course. Still, I held tight to my beer in true celebration of National Drink Beer Day. That was Drink Beer Day. This has been something I’ve been celebrating for over thirty years. It started in high school, although honestly, I really wasn’t drinking that much beer in high school (I seem to recall more grain punch and bug juice). I picked up my game in college, and then some (our 11 in 11 party comes to mind – 11 kegs in Townhouse 11). I’ve been drinking beer regularly ever since. It’s the drink I will opt for when asked. It’s just nice and easy. Always refreshing. Today’s celebration was a more mature take on this day. It made me appreciate the act of actually drinking beer in a more social and enjoyable way. Still enjoying it all, but in moderation and as the ice breaker. I wouldn’t have wanted to have been out there without a beer and that’s a testament to why we drink it. I’ll keep drinking beer as long as I’m in social situations. I just hope I can correct my slice. I always thought I was a lone wolf in my love for corned beef hash. Not completely alone – it’s still a regular on most breakfast menus, but I just felt like it was one of those old fashioned meals that you hear about but don’t actually order, although I do. It’s not the breakfast meat of choice of this particular generation (that would be bacon). Not long ago, I went to breakfast with my brother and sister-in-law and it turns out they are fans of corned beef hash too. I wasn’t alone. And then I started to hear about other people who like corned beef hash too. Apparently this is something that people like. I think the corned beef hash community needs some positive PR work to get it back front and center in the land of breakfast. More people have to come out of the corned beef hash closet and know that it’s ok to be a fan. National Corned Beef Hash Day is a perfect day to do this. While I didn’t find the exact history of corned beef hash, you can make some easy assumptions about where it came from. It’s a way to stretch your food and leftovers. You take your left over beef, your left over potatoes, some fresh onions. You chop them up and then fry them up in a pan. It’s economical – stretching your food for another use (like making a soup). I’m sure corned beef became a popular variety of hash because it was cheap and with all the preservatives, it would keep a little longer. Once again, another product of frugal folks in the kitchen making food supplies last. I first discovered corned beef hash in my house. My mom used to make it and she was always a fan. Me? Not so much back then. She would make it using a meat grinder which was a tool that belonged to my grandmother and was probably purchased in the early 1900’s. It was hand-cranked. She’d take it out of the cabinet where it was stowed, affix it to the table by the vice clamp that was part of the design. You’d feed leftover corned beef and potatoes into the top and they would be ground up and spit out the business end as you turned the crank. The hash would come out in long strands of chopped up mixture which would fall apart in the bowl where it collected. It made a gross sound too as it ground – just imagine what meat being pushed through tiny holes sounds like. As a kid, this machine was fascinating and you always wanted to work it. You could nibble on the stuff that came out the front (it was already cooked) and that was ok. My mom would then make patties from the ground up meat and fry them up for dinner. I didn’t like that as much, but later in life, I learned to love corned beef hash. At some point I had the epiphany that hash was just ground up corned beef and potatoes, both of which I liked, so why wouldn’t I like hash? I tried it and I’ve been a fan ever since. I celebrated today by going to our local breakfast spot, Reidy’s. That was something that I don’t think I’ve done before – stopping there for breakfast on my way to work as if I was a regular. Usually my trips there are leisurely on a day off or weekend, but this one was all business. I had to get in and out because I still had to get to work (and naturally, I was running late). I sat in a booth. I could have sat at the counter but it looked mostly full and there was chatter amongst the regulars. I was looking for peace and quiet and wanted the comfort of my own space at a table. I sat down and was greeted right away. I ordered a cup of coffee and two eggs, over easy, with corned beef hash and rye toast. As I waited, I played on my phone trying to be as antisocial as possible. My breakfast was ready within minutes and I was left alone to enjoy my National Corned Beef Hash Day feast. I should do this more often. Everything about this breakfast was perfect. The hash was nice and flavorful and cooked perfectly too so the outside had a beautiful crispiness to it while the inside was moist and juicy. You could taste the flavor and saltiness from the beef and you also got the hints of onion and potato in each bite as well. The eggs were over easy and as soon as I ran my knife through them, the yolk oozed out over the plate. That made the perfect pairing for the hash too giving me the added hints of egg flavor in each bite. The best way to eat this was to take a piece of toast and build little bites of egg and hash. The rye toast was kind of the star of the whole dish. I usually opt for white or whole grain bread, but for some reason I went rye. Rye? I don’t know. It was the perfect firmness for my constructed bites. It had great flavor and it was perfectly toasted with ample butter on each piece. This was a great breakfast. Even the potatoes were good too, although I didn’t eat all of those – I had enough potatoes in the hash. I was finished and went up to the register to pay, a smile of contentedness upon my face. I was in and out in fifteen minutes and on my way to work. I can really seeing myself getting in the habit of doing those more often. I have a feeling corned beef hash is one of those foods that is going to suddenly become popular again. Some hipster in Brooklyn will probably open a restaurant that specializes in it (he’ll likely call it The Hash House). It will be featured on Food Network and then interest in this delicious but old-fashioned breakfast treat will become popular again. There will be hash restaurants in every city and even special kiosks at the mall. It will reach its height of popularity when Subway starts featuring it on one of their subs. When all this happens, I can be proud to say that I was in the know from the very beginning. I was ahead of the hash fad, although I suppose I have to credit Reidy’s for really being ahead of it all and serving a great one. My celebration today reiterated my love for corned beef hash. I will continue to make this my order at breakfast places. I may even make the sojourn to The Hash House when it opens – that’s how good corned beef hash can be.